For a lot of people – especially women – their legs are the first place they gain weight and the last place they lose it. And it’s true, thigh fat can be especially stubborn to lose. Luckily, there’s a pretty straightforward answer when it comes to how to get rid of thigh fat. Certain exercises can help speed up the process of losing thigh fat, and the good news is, they don’t involve a lot of fancy equipment. Even though some exercises help sculpt shapely leg muscles, you still need to burn the fat around your muscles for your hard work to show. The desire to burn off that fat leads many into the “chronic cardio” trap, where they start spending hours on the treadmill. Unfortunately, this type of cardio has been proven to be ineffective when it comes to serious fat loss (1). And on top of doing chronic cardio, many people use exercise machines to try work their leg muscles – hamstring curls, leg extensions, and the like. 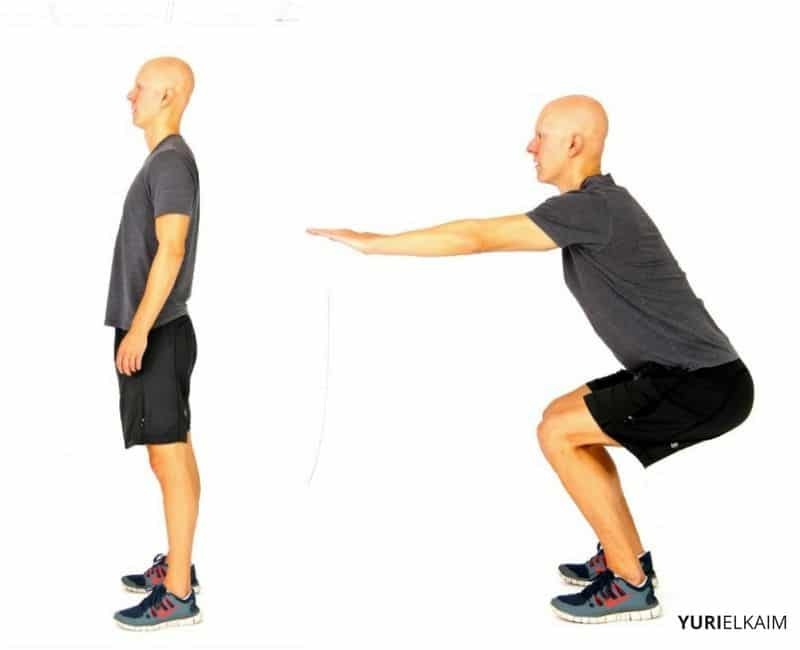 These exercises provide subpar results because they fail to mimic natural human movement, which can also lead to muscle imbalances. They are also less effective at burning fat when compared to more intense forms of exercise. This is where compound exercises take center stage. Not only do they sculpt muscle, they also burn fat. Compound exercises involve more than one major muscle group at a time. Unlike steady-state cardio and isolation exercises, these exercises take more effort (and burn more calories as a result), build muscle, and increase fat burn – not only during your workout, but for several hours afterward (2). They also increase your metabolic output in the long term. In fact, a study published in the European Journal of Applied Physiology showed that a 30-minute compound-exercise workout elevated participants’ metabolisms for an astounding 48 hours after the workout – a marked increase over longer, steady-state cardio workouts (3). This is extremely important for fat loss, as your resting metabolic rate accounts for roughly 70 percent of the calories you burn each day. Not only that, but compound exercises help build muscle. Why does that matter? Muscle burns more calories at rest than fat. In fact, muscle burns 7 to 10 calories per pound versus only 2 to 3 calories per pound of fat. The longer post-workout fat burn plus the fact you have a bigger fat-burning furnace (more muscle) makes compound exercises the holy grail when it comes to fat burning (4). The best exercises for sculpting lean, toned legs are “big movements” that target your entire lower body. You can also add dumbbells that allow you to perform only 6 to 8 reps of each exercise with good form. That number of reps will help you sculpt your legs without building excess “bulky” muscles. Perform 2 to 3 sets each, and you’ll soon get rid of thigh fat for good. 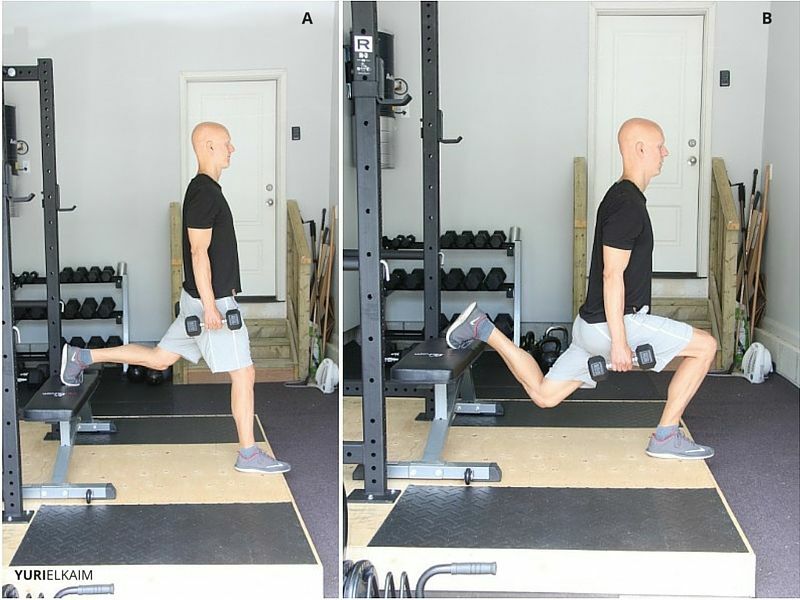 Before we jump into these leg exercises, it’s important to address a few common mistakes many make when performing lower body exercises. Rounding the spine. It’s tempting to round your back or slouch forward during a squat (especially when you’re using weight). Avoid this, as it puts heavy strain on your spine. Instead, be sure to pull in the stomach and keep the spine straight by pushing your hips back as you lower. Knees falling past the toes. Another common mistake is bending the knees out over the toes while squatting. This causes intense strain on the knees and can easily lead to injury. Remedy this mistake by pushing your hips back as if you’re sitting in a chair. Keep your chest open and spine straight. Now, let’s get to those exercises! Weighted step-ups target the glutes and hamstrings, while also revving your heart rate for maximum fat burn. Begin holding a dumbbell in each hand that is a challenging weight. Remember, we want to feel the burn at 6-8 reps on each leg. Step your right foot onto a 12-inch step box or chair and push to standing at the top. Lower to your starting position and repeat on the other leg, alternating sides. Squats are one of the most fundamental lower-body exercises, and are a must for sculpting tight glutes, hamstrings, and quadriceps. Begin standing with your feet slightly wider than hip-width apart, holding a challenging weighted dumbbell in each hand by your sides. Pushing your hips back with your spine straight, lower toward the ground. 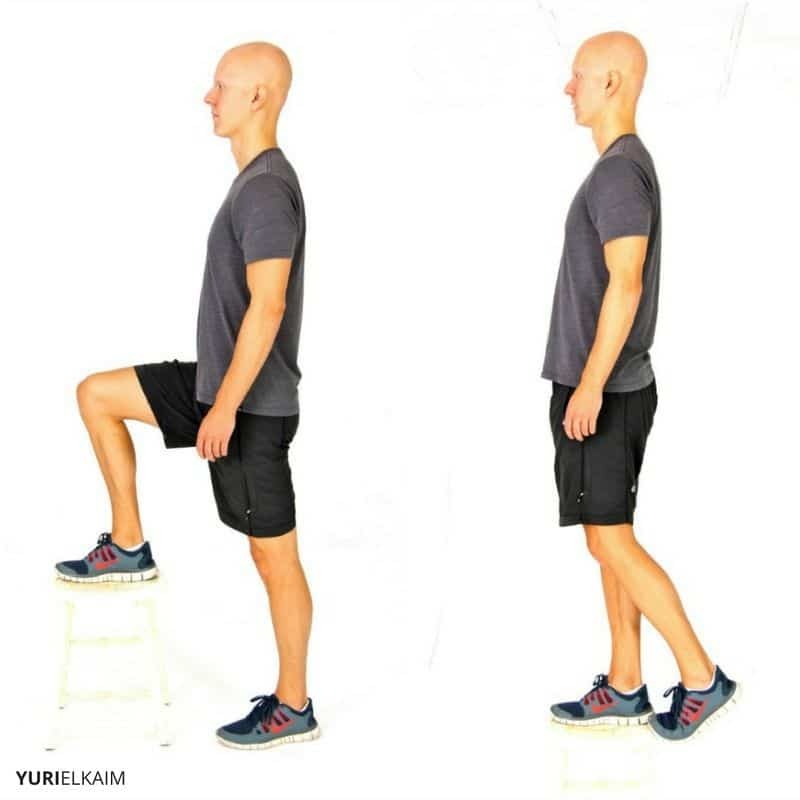 Once your thighs have reached just below parallel, return to standing. Repeat. Here, your weight (either barbell or kettlebell) is placed in front of your body. 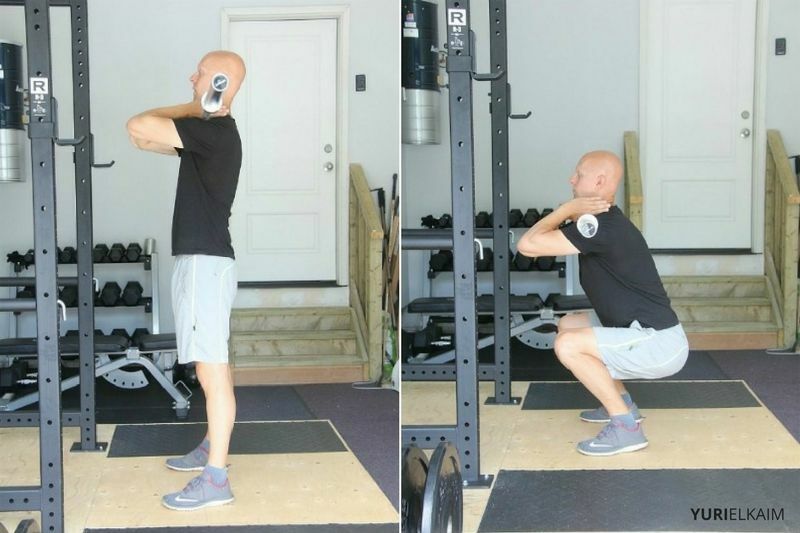 This challenges the entire body from the chest down, and is also said to be superior to the regular squat due to reduced pressure on the lower back. Begin standing with feet slightly wider than shoulder-width apart. If you’re using a barbell, place it on the front of your shoulders, keeping your elbows high to act as a cradle. If you’re using a kettlebell, grasp the bottom, holding it in front of your shoulders. Lower into a squat, avoiding leaning forward. You’ll notice the takes quite a bit of balance. Deadlifts are amazing for building tight glutes and hamstrings, while also strengthening the lower back and core. Begin standing with your feet hip-width apart, a challenging weight in the form of a barbell or kettlebell on the ground in front of you. Bringing your feet under the bar, bend your knees (keeping your back straight) to grasp the bar. Pull up to standing using your glutes. Lower the bar back to the ground and repeat. 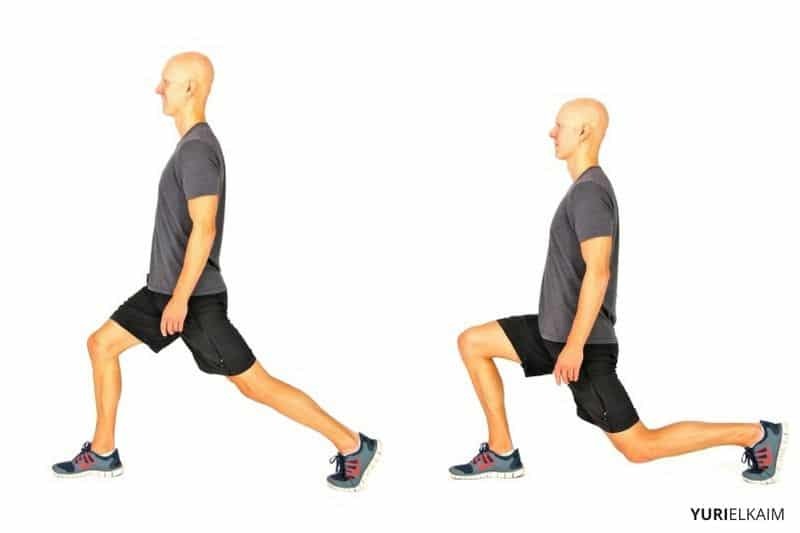 Forward-backward lunges have all the benefits of the traditional lunge, with added burn. The alternating motion of lunging forward, then backward, without rest will kick your heart rate into high gear. Begin standing tall. Extend your left leg behind you to come into a reverse lunge, knees behind your toes. Push to standing, but instead of stopping there, extend your left foot forward into a forward lunge. The Bulgarian lunge, also referred to as a split-squat, is excellent for working the entire lower body. It also requires a great deal of balance, as one foot is propped on a bench behind you. This strengthens the smaller stabilizer muscles in the core as well as the legs. Begin by holding a dumbbell in each hand, placing yourself in a staggered stance (one foot forward) with one foot propped behind you on a bench or box. Lower toward the ground, bending your knee and keeping your spine straight, until your thigh is parallel to the ground. Push through the heel to return to the starting position and repeat. Lateral lunges engage the glutes, hamstrings, inner thigh region, and even the core. 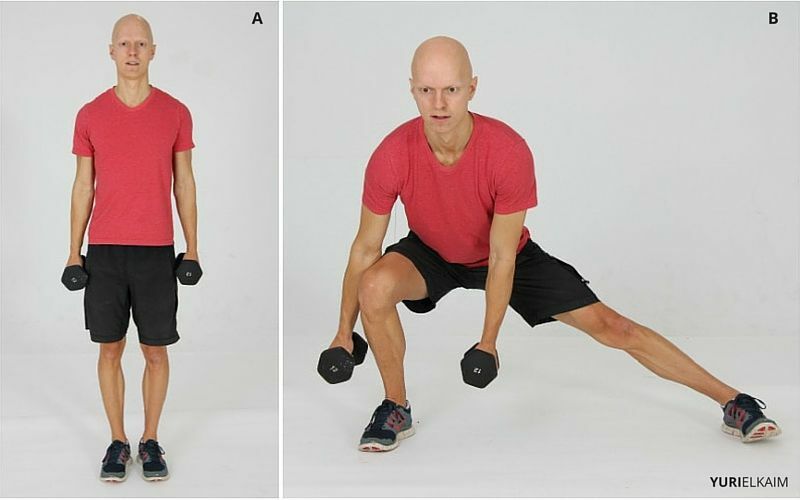 To make these more challenging, hold two dumbbells in front of you as you lunge. 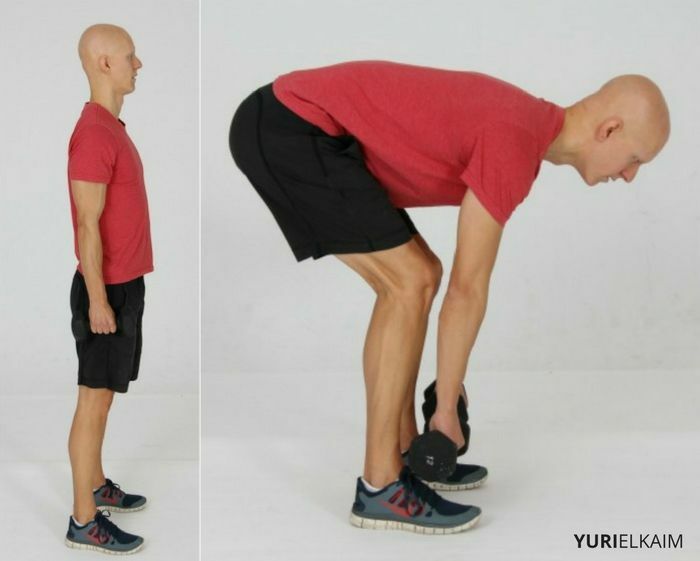 Begin standing with feet hip-width apart. Making sure to point your knee in the same direction as your foot, take a large step to the right, keeping the dumbbells at your sides. Push your glutes back and lower your hips until your thighs are parallel to the floor, keeping your knees behind your toes and your spine straight. Return to your starting position using your glutes and hamstrings. Repeat, alternating sides. Here is a quick workout demonstrating how to string together these exercises with other movements that will really kick up the fat-burning effect. Perform this workout 2 to 4 times a week on nonconsecutive days, and don’t be afraid to use heavy weight. In fact, any weight you use should be heavy enough that it only allows you to perform 6 to 8 reps of each exercise. Warm up: 5 minutes of light cardio. Repeat for 2 sets with 30 seconds rest between exercises and sets. By doing that workout – or one like it – these compound exercises will not only melt away your thigh fat, but you’ll also notice improvements in your core strength and overall fat loss. Get a Free Fat-Burning Workout! Get slimmer, fitter, and sexier with the Fat Blaster workout, which is designed to rev up your metabolism for hours. No more guesswork – this workout includes an instructional video, workout tracker, and follow-along audio. A $29 value – it’s yours for FREE!